As recently as the 1970s, access to public transit for people with disabilities wasn’t guaranteed, and in many places did not exist at all. Two wheelchair users blocking a Green Line Trolley to protest lack of access to Boston's public transit system. 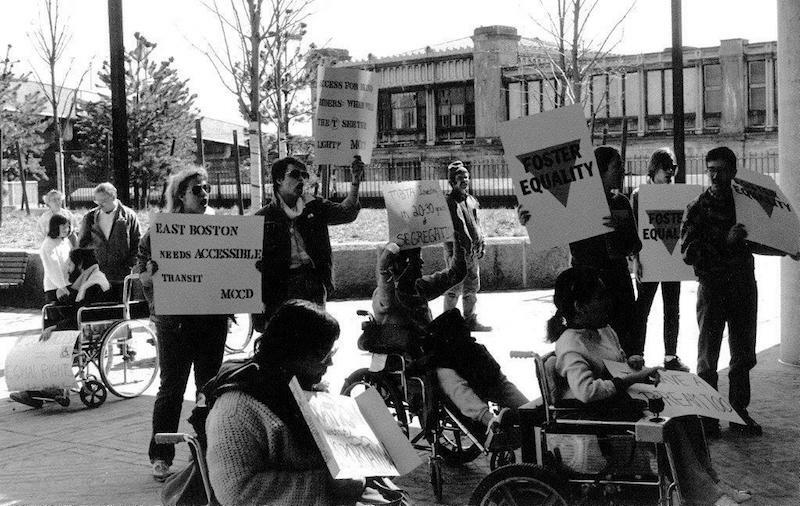 Decades of groundbreaking advocacy from disability groups like ADAPT, whose members blocked Chicago and Denver bus routes with their bodies, paved the way for cities like Boston to make significant progress in accessible transit. In 1973, the Rehabilitation Act required that any programs or services funded by the federal government be made accessible. 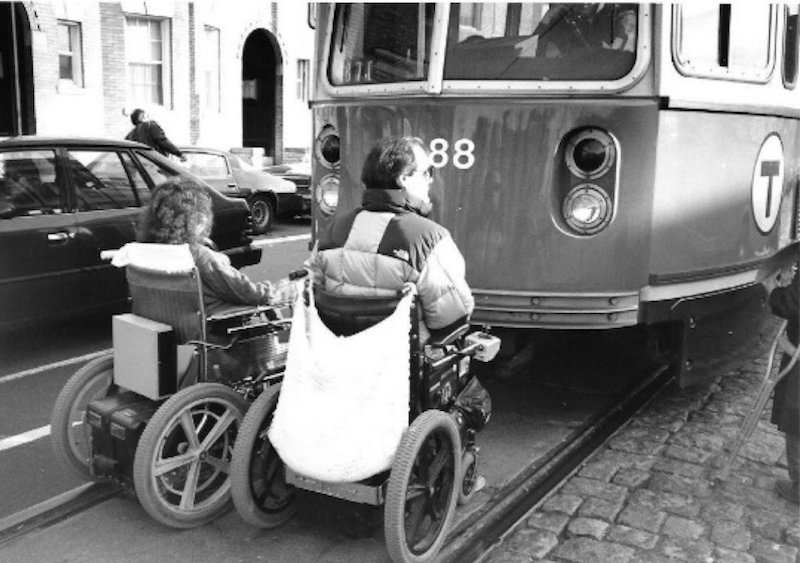 In 1990, The Americans with Disabilities Act (ADA) reiterated these responsibilities, and changed the way cities treated public transit accessibility. MBTA customers protesting lack of access in East Boston in the 1980s. 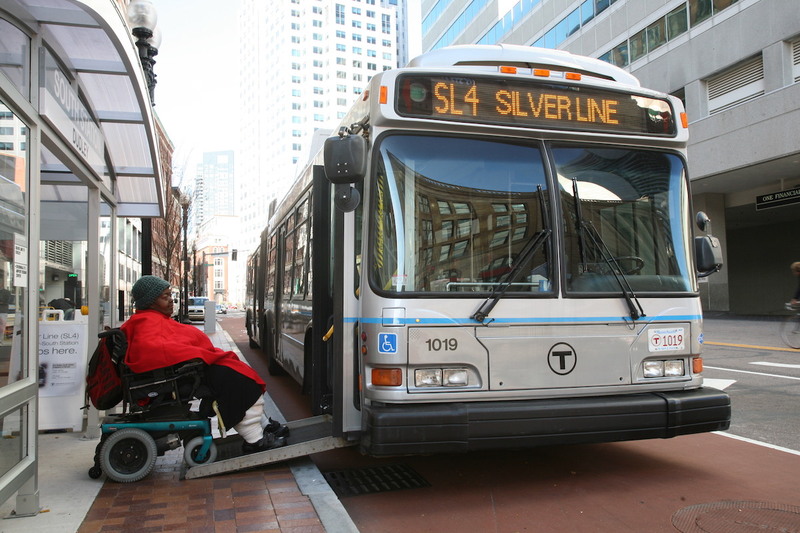 Boston was no exception: The MBTA purchased a fleet of wheelchair-accessible buses and created an ADA-compliant Key Station Plan to outline how the agency would make popular subway and Commuter Rail routes accessible. Despite early progress, by the 2000s, customers with disabilities still could not safely or reliably access key MBTA services, even though it was required under both federal and state laws. Plaintiffs in the 2006 MBTA/BCIL Settlement Agreement, along with the MBTA, announcing the signing of the settlement. At the time, studies found that many MBTA elevators at busy stations were often out of service. Furthermore, bus operators weren't always boarding customers with disabilities, either by choice or because accessibility equipment wasn't working. In 2002, represented by Greater Boston Legal Services, a group of 11 customers along with the Boston Center for Independent Living (BCIL), filed a class-action lawsuit against the MBTA, Joanne Daniels-Finegold, et al. v. Massachusetts Bay Transportation Authority. 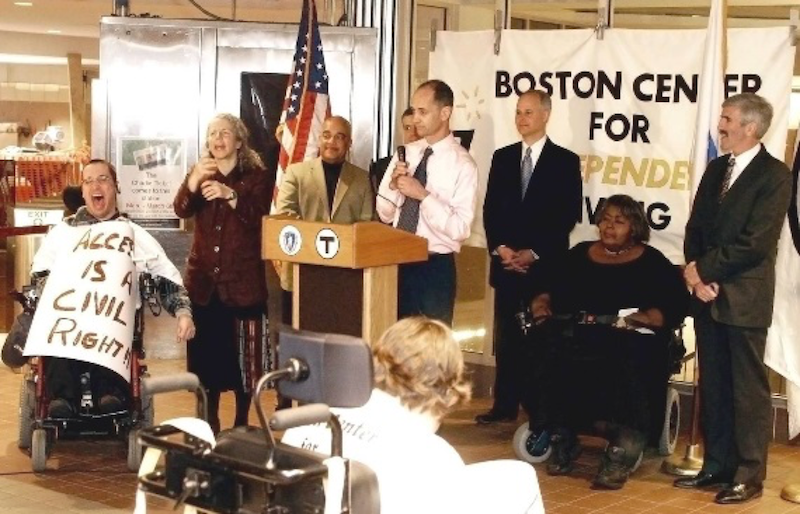 In 2006, the parties entered into the MBTA/BCIL settlement agreement, forever changing the future of accessibility at the T.
Since the MBTA/BCIL Settlement Agreement was signed, a number of significant, sweeping improvements have been made to the system. Woman using motorized wheelchair boarding the MBTA Silver Line. Some changes are required by the settlement, but many are not. The MBTA strives to go above and beyond the terms of the agreement to create a model of accessible transit for the entire country. Each change has been the result of a strong partnership between the plaintiffs, the MBTA, and Judge Patrick King, who serves as Independent Monitor of the settlement. One of the settlement’s major provisions was the creation of the Department of System-Wide Accessibility (SWA) in 2007. MBTA staff and Boston Mayor Marty Walsh celebrating SWA Day at City Hall Plaza. SWA is led by an Assistant General Manager who reports directly to the General Manager and oversees the accessibility of bus, subway, ferry, and Commuter Rail operations. SWA reviews most construction plans and projects to ensure accessibility is properly considered and implemented. The department is a leader in the creation of customer-facing policies and procedures, as well as in the development of internal programs and employee training. 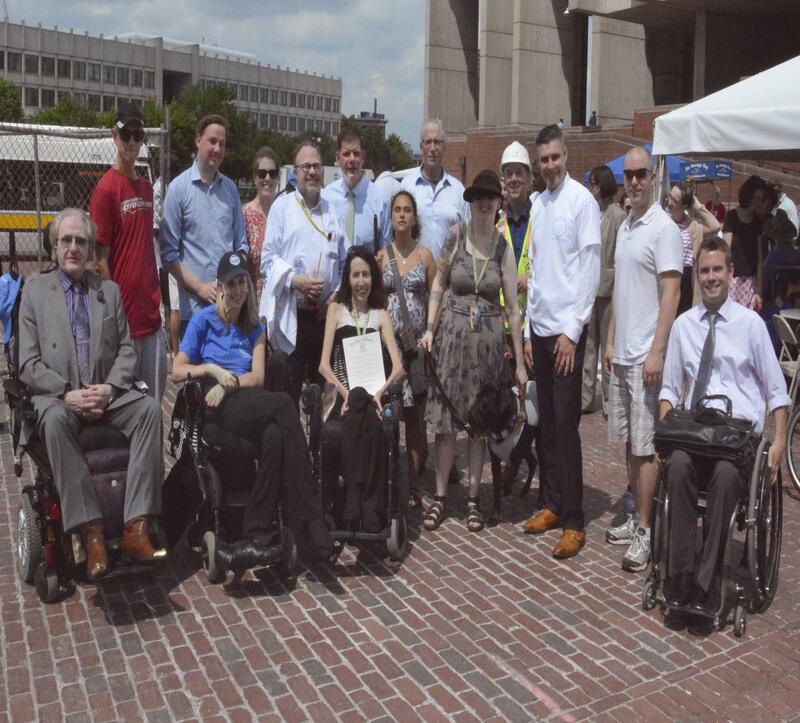 On July 13, 2016, the City of Boston declared a“System-Wide Accessibility Day” to celebrate the T’s commitment to improving access to public transit. Previous to a new maintenance contract for MBTA elevators in 2006, station elevators were only worked on when they were broken or in disrepair. Since the signing of the new contract, MBTA elevators are maintained year-round, resulting in system-wide uptime averaging 99.5%. 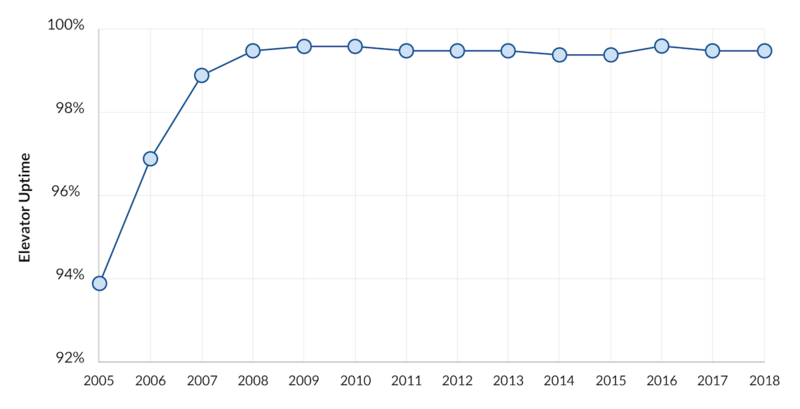 Elevator uptime was once just 94% in 2005, but has remained near 99.5% over the last few years. The MBTA also changed design standards for all elevators, which now feature transparent wall panels and more space to improve customer safety and comfort. Since 2006, more than 50 new elevators have been added to the system, with 10 additional elevators under construction, and 60 in design. Along with elevator upgrades, improving access to bus service was a primary goal of the MBTA/BCIL settlement. Today, all bus operators are thoroughly trained to provide excellent service to customers with disabilities. Over the last decade, the purchase of hundreds of new low-floor buses have enabled the MBTA to retire every lift-equipped high-floor bus. Today, the entire MBTA bus fleet is accessible, improving service for 450,000 daily bus riders. SWA also began overseeing an Internal Access Monitoring Program that provides real-time feedback about how the system is—or isn't—working. On December 4, 2018, the MBTA reaffirmed its commitment to fulfilling the MBTA/BCIL settlement by entering into an amended agreement that clarifies remaining work, outlines a plan for evaluating compliance and defines obligations that will continue even after the end of the agreement. As the MBTA continues working towards full compliance with the settlement, there are a number of projects currently underway that will help build a system that's fully accessible to all customers. The Plan for Accessible Transit Infrastructure (PATI), aims to identify and prioritize repairs for barriers for accessibility at all MBTA stops and stations. A pilot program for bluetooth beacon micro-navigation systems help customers who are blind or have low vision navigate the system. The MBTA system has changed substantially between 1990 and 2017. As of today, almost the entire system is accessible, including the entirety of the Orange and Silver Lines, most of the Red and Blue Lines, and major sections of the Green Line. Upgrades to Wollaston Station in 2018 will make the entire Red Line accessible to people with disabilities.